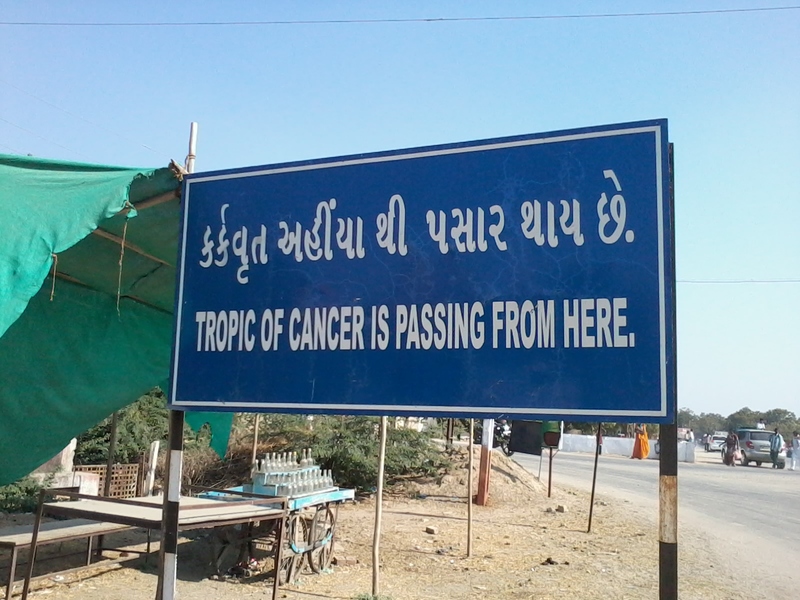 The board indicating the passage of the Tropic of Cancer on the outskirts of Becharaji, Gujarat. Part 2 of my trip to Zainabad. Read the first one here. The next morning after checking out of Desert Coursers, caught the state highway 19 north towards Becharaji. Indian roads do have a lot of travelers. Not just vehicles. Cows, goats, sheep, buffaloes. On way, sighted many markers indicating the presence of an ancient Jain temple in Vanod, a small village. Decided to have a look. Very beautiful and well-maintained, the priest, acting as a guide, told us the story of this 1500 year old temple. Considered one of the greatest kings to rule over Gujarat, Vanraj Chawda had a tough childhood. His father was assassinated and his mother had to escape to the forest, where Vanraj grew up and was educated by Jain priests. This temple has his gaddi (seat) and some of his personal belongings. He later assembled an army, fought and regained his kingdom, and went on to make Patan among the richest Indian cities during that era. He also established the city of Champaner (wrote about it in an earlier post). Reached Becharaji by 11 am. The temple town of the Goddess Bechara Maata, along with Ambaji and Pavagadh, rank as the holiest places of worship in Gujarat. But why the extremely long lines with lots of police? Found that it was the full moon. An auspicious day to visit. This is also an important place of worship for Hijras (eunuchs). We didn’t see any though, even on this day. Just outside Becharaji, we came across the Tropic of Cancer. This latitude divides India into half, the temperate zone above and the tropical below (remember the school geography classes?). Exits India at the eastern end in Tripura. And then on to Uvaarsad. My friend’s kuldevi (family Goddess). Again a small village. But a huge temple. We Indians do splurge on temples! As we approached Ahmedabad, the roads got broader and the traffic more angry. The relaxed pace of the villages gave way to impatient honking and overtaking. But for the first time, after the emptiness of the desert, the noise and the crowds seemed somehow comforting. You should have captured more highway signs! Hey Nice. Actually being to the start of the tropic of cancer… amazing!! Very informative. Thank you! They didn’t even have a board when I visited some years back. Such prominent things should definitely be highlighted.